CIETC, Back to work and Ohhh my back! 4:30 and we’re getting a little bit of a late start. We all came in a little early to help write the show this morning…it wasn’t late enough for me. I’m having a hard time raising my arms. As predicted, I went outside yesterday and found my snowblower not working. So I went to work with the shovel. Three and a half hours later, I was done with the driveway and the walk. I’d also soaked a shirt, sweatshirt, scarf, and one of those pull over ski masks right through. I must have been a sight to see. I was sore last night and I’m even more so this morning. Who’s bright idea was it to buy a house on a corner lot anyway? More on the news in a few minutes, but it’s time to go get ready for the show. 5:43- It seems like this morning is flying by. Cup four of coffee may be helping that pace. We expect the headlines could me dominated locally by the CIETC salary scandal today. Remember this?….Leaders at the job agency took huge salaries over a few years and are accused of mis-using the federal funds that were supposed to help people who were out of a job. The US Attorney’s office called a news conference this afternoon and the indications point to news about CIETC. Fidel Castro is supposed to be on his death bed again. This time reports are coming from a Spanish paper citing doctors who treated Castro… What is the saying…Reports of my death have been greatly exaggerated. 6:19-Breaking news. There’s a housefire going in Mingo and Chopper 13 is on the way. Look for pictures in a couple of minutes…This story came in as a tip on our newsline. First thanks to the viewer who called in…second, feel free to call in a news tip like this anytime…or blog about breaking news…We’ll see it as we check the blog all morning. 6:41-Golden Globes talk: The girls threw down on Monday and told me to look for the best and worst dressed. So I did my homework and watched as late as I could. I come to work this morning…neither of them watched!. -Angelina Jolie…nuff said…I’m a converted fan and she doesn’t need to do much to look good. -Brad Pitt-Wear a tux man…the tie makes you look like a stunt double in Men in Black. -Sheryl Crow- Wowza…Classic Dress and I like the blonde hair. -E Channel coverage-Bad bad and bad. I would think you’d have some questions for the people who come up to talk to you. It was pretty bad. Trisha’s 2 cents’ worth: I did forget to watch, but in looking at the pictures, I think Jamie Foxx looked great, so did Jennifer Hudson, Penelope Cruz and my hubby’s crush, Evangeline Lilly from Lost. I hate to admit it but she looked stunning, as usual! Liked Reese Witherspoon’s bangs too – they’re definitely back in style! 6:57: An update on that fire…Liz is on her way to Jasper County. We’re hearing there are some buildings close in the area…Firefighters are doing a good job of keeping the flames contained to just one building. We’ll get more details to you as we get them. 8:03 It’s Trisha adding a couple of things. IF this announcement ends up being about CIETC as we believe, we’re in for one heck of a news day. Taxpayers understandably get very fired up about greed and fraud involving their money. I did a double take when I first read this story this morning. The ethics board for a hospital in NY has given them clearance to let women get a uterus transplant from a deceased donor, so that they can give birth. I have so many questions about this. Given the enormous job a uterus has during pregnancy, I’d imagine there’d be huge risks using a transplanted womb! I’m all for people using medical miracles to become parents, to a certain point, but this, for me, seems to cross a line I’m not comfortable with. 8:17 Just got some new info on that fire near Mingo – a mother and daughter got out safely (good news!) but this is interesting.. fire crews were called out YESTERDAY to check problems with a chimney from a wood-burning stove. The fire is out, but crews are still out there watching for hot spots. The fun never stops around here! I have that James Taylor song in my head. I’m definitely dreaming of a warm sandy beach right now. It’s so bitter out there today I just want to put on 10 layers of fuzzy warm clothes and sit in front of a roaring fire with a huge mug of hot coffee and a cat on my lap. Doesn’t that sound like a dream? Calvin on the other hand is probably already bugging Ian to put on his snowsuit. 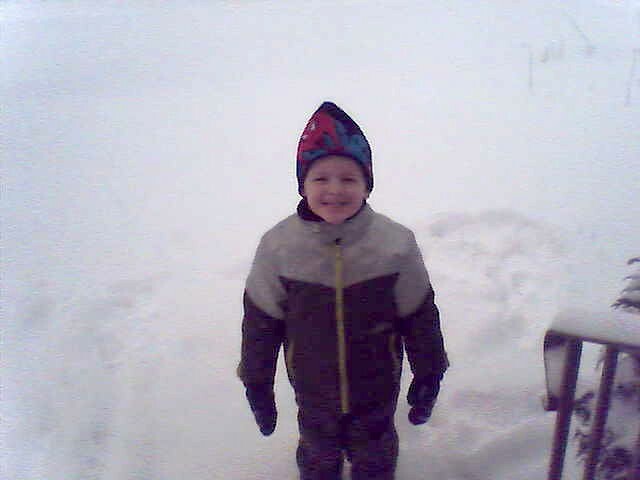 Yesterday the little bugger was out in the snow for about an hour while Ian shoveled. (Clara and I were smart and cheered them on from inside.) I had to practically force the red-cheeked little guy to come in, peel off his icy clothes, and drink hot chocolate to warm up. No preschool today, but luckily we have even better entertainment – GRANDMA AND GRANDPA! They are totally crazy about the grandkids, and spent hours making them giggle yesterday. Grandma Susan taught Calvin how to use a balloon to make farting noises in the bathtub. He was screaming with laughter, and stayed in there until his hands were prunes! Susan is amazing with kids. She never runs out of patience when her grandids find something fun. Calvin just lights up around her. 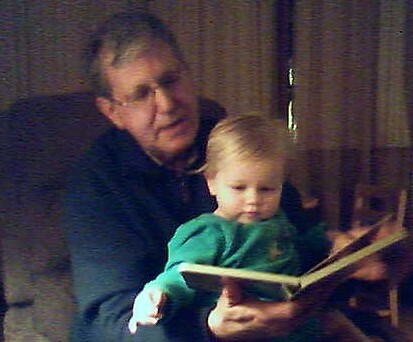 “Papa” Paul let Clara climb up in his lap to read a book. They’re impressed with how much better she’s awlking and talking since they saw her just 3 months ago. Grandma and Grandpa say they came armed with snow gear, and I’m sure Cal will want them to put it on and get out there with him today! We’ll see how long the Georgia natives can hold up in this weather! Patrick:I feel your pain! Been there. Done that. Suggestion: buy a townhome … it was a relief to see someone else plow my driveway and shovel the walk yesterday! :-)Keep up the GREAT work,Dave in Des MoinesP.S. Looks like yesterday’s show’s “Godzilla” hiccup has been corrected. Pat, we have a corner lot to in Altoona and Its huge. Its the biggest house in the estates and its a burger to shovel. Thank god my sister has a boyfriend who lives close. He came over Sunday afternoon, shoveled what was there and then came back Sunday night and finished the rest and then me and my mom just had to snow blow the remnants from the blowing snow yesterday. I love him! Otherwise, last year it took me 2 hours to shovel the sidewalks, and then another 2 hours to shovel the driveway while my mom and sister watched. We take turns. I get the next snow storm. Jeriann, please tell me theres no more snow in sight… Please oh Please. Trisha- Your kids are so adorable. I love hearing stories and seeing pictures of them. I don’t know what I would do if you gise stopped blogging! I love it! Keep up the good work everyone! Oh Trish, on Friday night, did you like how Shawn Terrell called you Sonya? I caught that one! I just laughed. Have a good one! Trish, hope your eye is doing better – its amazing what happens to us poor moms :-) Thanks to all of you for your great coverage in the morning – you make the AM bearable!!! Patrick –I don’t mean to gloat – but I do have a snowblower and I even do my deck, so I have a clear walking path to the hot tub. Felt great last night….